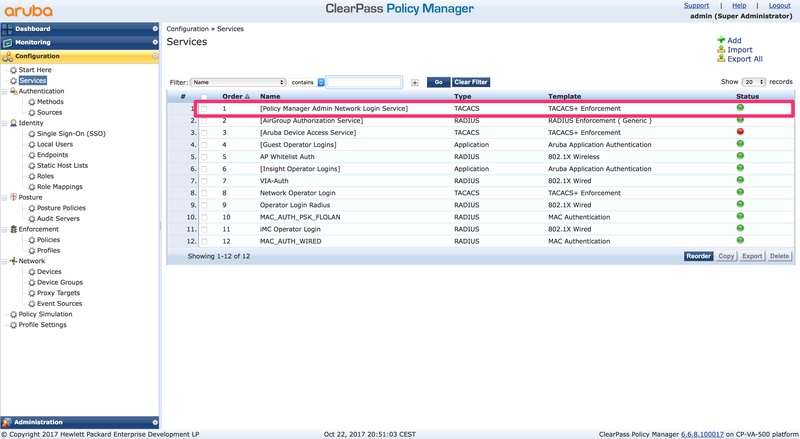 When you setup ClearPass, you always need to authenticate your operator. 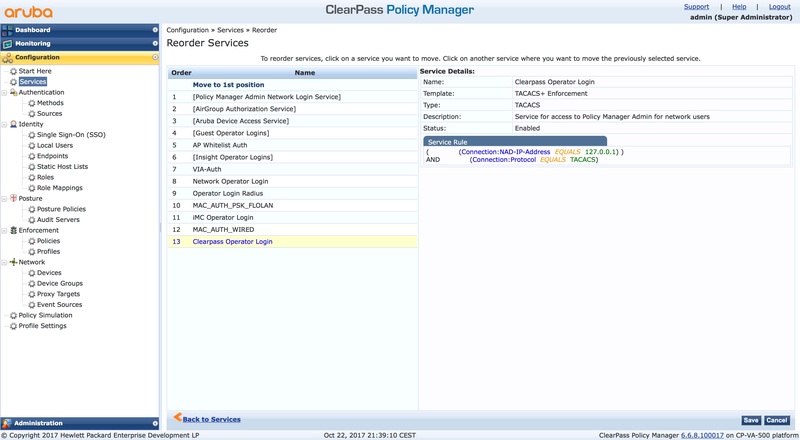 In this post, I will describe an easy way to use Active Directory for ClearPass operator login. I use AD here because most of my customers use AD. 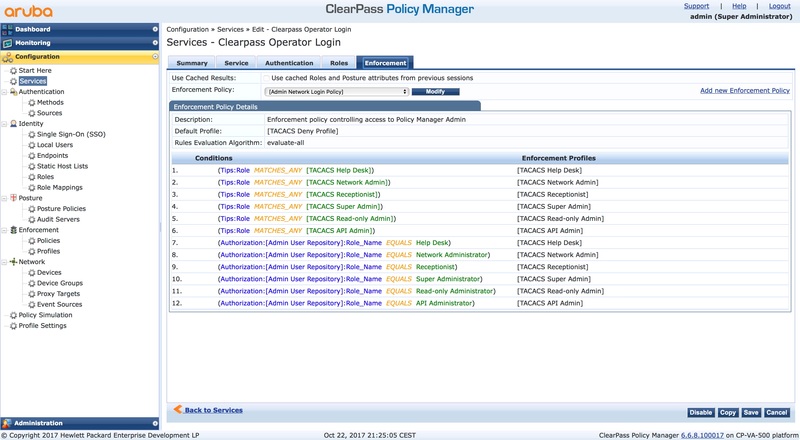 So, we can work with it and do not have to set up something new or use the admin database in ClearPass. This will only create a shadow database with separate passwords and a separate structure. The service is the same as the original one. But we change this soon. You can also change the description, but actually, the default description is pretty good. Add the AD to the list of “Authentication Sources”. I also set it to top of the list as this is my main repository for users. Leave the existing sources in the list. My users use “[email protected]” as authentication name. To strip the “@domain.tld” from the name enable the “Strip Username Rules” and add “user:@”. This is the default enforcement policy. There are many conditions for default roles. I simply match my AD groups to those roles and so I can use the “[Admin Network Login Policy]”. This saves me a lot of time. But, as always, you can, of course, create your own rules and policies. But remember, to have a fallback plan, include the conditions from above in your policy. This makes sure, you can use the local admin account in the condition of disaster. so, change the default password for the admin account to something safe and complicated and hide it somewhere. Move it to position one. And now, finger crossed that it works. 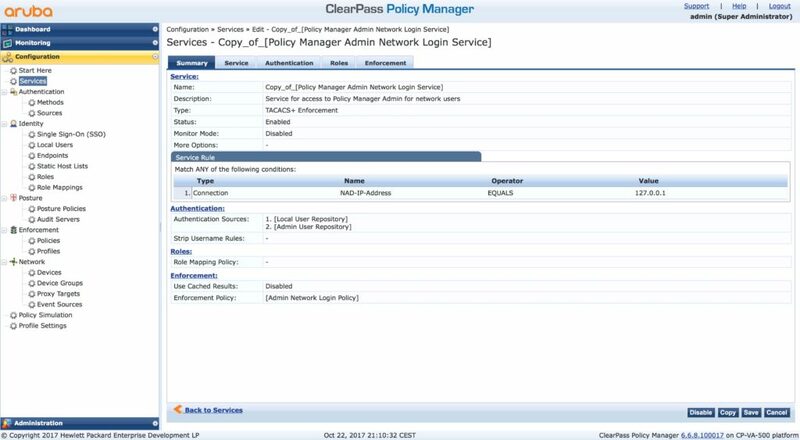 Logout from ClearPass and use an AD account to log in again. To make it, even more secure, use a different browser to test the login without logging out before. If you are in again, we did it correctly. You can now disable the old service. Just click the green light at the end of the row. It turns red. Also, test the login with the built-in account, to make sure that the fall back plan is working. If you find this post interesting, leave me a comment and share it with your friends. If you don’t like the post, leave me a comment and share it with your enemy. But whatever you do, leave me a comment, now.